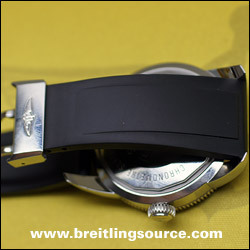 The Breitling Diver Pro II rubber strap was introduced in 2009 and is currently available along with the Diver Pro strap. Breitling has not announced the discontinuation of the aging Diver Pro strap as of yet. Price for both of these straps at this writing (11/09) are the same. The 22mm version of this strap is available in a deployant version that uses the same deployant as the Ocean Racer Rubber strap. All others are Tang Buckle. Below is a stock shot of the Diver Pro 2 on my Breitling SuperOcean Heritage 46.